We just finished this very controversial wild horse roundup of the Pryor Mountain Mustangs. We (us as the contractor and the BLM) got kind of beat up by Ginger Kathrens, and others with The Cloud Foundation and Elyse Gardner the self appointed “Independent Humane Observer” . I am going to just state a few facts here on our web site. But first I want to ask anyone reading this one question. Do you consider wild horses to be people, pets, wildlife, or livestock? I believe they still fall under the livestock category and that means they must be managed. 1. We captured 146 wild horses. There were no deaths and the only injuries were a couple of minor scraps that the animals got in the chute or holding pens. There was a vet there that observed each band right after they came into the trap and this vet did examine and care for two young foals that were lame. I believe these foals, along with their mothers, are still being cared for at Britton Springs. Yes I have seen Ginger’s video of the wild horses following their release. It shows one more lame foal. The other horses appear to me to be just fine. 2. Our pilot, as always, did a wonderful job moving these wild horses. First he brought wild horses from the low land areas to the trap at Britton Springs. These wild horses are so use to vehicles and people that they just walked ahead of the helicopter. We had a couple of Wranglers go help the helicopter move these wild horses to the trap. Next he herded the wild horses living on the Forest Service land to a trap located up on the mountain on that Forest Service land. Then he brought the rest of the horses off the mountain and into the trap at Britton Springs. Our pilot is very patience and certainly did not run or stampede the wild horses. He herds them and drives them much like you would cattle. You can read more about this in the information part of this web site. Because these bands of wild horses were to be returned to the range as bands, minus the ones targeted for removal, our pilot tried to bring the animals in band by band so they could be easily identified and sorted. A couple of times he had more than one band. Then the animals were put in one big pen and they separated themselves. He did separate one mare with a small foal from one of the bands and leave them behind because he felt that was the best thing to do. He took hours bringing the animals down from the top of the mountains. All foals came in with the bands. It is 10.8 miles from the trap site to the very back end of the designated wild horse area but the animals were not that far away from the trap. 2. All of the BLM people and our wranglers did an excellent job of processing these wild horses. Everyone worked together and when something happened like the one animals that pushed out of the chute or one that reared up in the chute they responded and handled each situation correctly to keep the animals and workers safe. One day there was some problems with the chute. It is hydraulic and a couple of horses pushed on the front and got out. They were moved back around and brought back through. The BLM wrangler that did the freeze branding and etc. is an expert, having worked with wild horses for a number of years in this capacity. He hardly ever uses the neck rope and almost all wild horses stand more or less still for the branding, etc. This is a much less stressful method for the wild horses. But because one wild horse put his head out of the door, and even though it was then released and brought back around, pictures appeared that indicated we were not doing the job correctly. So after that the neck rope was used. It is another method and works well but it is more stressful on the animals. But the observers who do not really understand seemed to think this was better. 3. Most of the designated Pryor Mountain Wild Horse Range is low desert where there is very little feed. The two mountain meadows on top are way overgrazed. Please remember that there is no cattle grazing allowed in this wild horse range. While most of the wild horses appeared to be in good shape ( the ones living on the Forest Service were in the best shape) there were a few that appeared to be on the thin side and there were at least three foals that had what I call the leppy look (unhealthy looking shaggy long hair). This happens when a foal loses it’s mother and is making it on it’s own - hence the term leppy. Or a foal that has a mother but she is not producing adequate milk, as is the case here. 4. The older horses ( Grumpy, Conquistador, and the others) captured that are being offered for adoption were gathered from adjoining Forest Service land where they have been living and grazing illegally. You and I could not just turn our horses out on the Forest Service land to graze and neither can the BLM. These wild horses were trespassing. 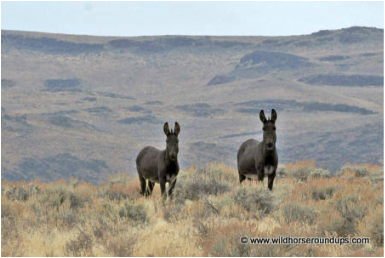 They can not just be released back on the wild horse range because they will immediately return to the Forest Service range. 5. These older wild horses, if not adopted to good homes, will probably go to some non profit group or groups who have pastures for them, maybe even room for all of them to go to the same place. That is what the BLM and the Pryor Mountain Mustang Center is trying to do. Nothing bad is going to happen to them. 4. We did remove young animals from some of the bands, including Cloud’s, to get the numbers on the range to within AML (appropriate management level). I believe 3 were removed from Cloud’s band. Two of them were his own daughters that he would breed and that would produce more inbred foals. The third one Image is a foal from Cloud’s other daughter. This mare was given the PZP and released with the band. The hope is when she comes back in ready to breed she will have been picked up by another stallion. I am not a vet but Image is not a very healthy foal. It is the job of the BLM to manage and protect the wild horses and this what they are trying to do. 5. There is an article in the Billings Gazette titled “Noted Geneticist gives his two bits on significance of Pryor Mountain mustangs “. Anyone interested in the genetics of this herd needs to read this article. You can find it on their web site	www.billingsgazette.com under Pryor Mountain Wild Horses. These wild horses are not genetically pure. Other horses have been introduced over the years. 6. Please also talk with Matt Dillion or his father Don about these Pryor Mountain Wild Horses. Matt heads the non profit Pryor Mountain Mustang Center right there in Lovell, Wyoming. These two individuals and their group are the ones that have really studied these wild horses. They are the ones who have taken pictures of each and every one of them. They are the ones who have named and cataloged each and every one of them. Don takes people up on the mountain on tours to observe and photograph the wild horses. They watch these wild horses all year round and they know each one personally. This group worked closely with the BLM on this roundup and on choosing which wild horses should be removed and which wild horses should stay so there would be no inbreeding and so the genetics of the herd could be maintained. Their web site is www.pryormustangs.org. 7. Anyone interested in this roundup and these Pryor Mountain Wild Horses should also contact Ken McNabb. He took video pictures of the entire roundup and processing and of the range conditions and etc. His web site is	www.kenmcnabb.com. 8. Anyone reading this also needs to know that Jared Bybee and the Billings BLM have proposed to install 15 guzzlers to be placed all over the Pryor Mountain Wild Horse Range. With these guzzlers, the wild horses would be able to utilize the feed on that range. Ginger Kathrens and The Cloud Foundation has protested this plan. Does that make sense? 9. One last fact. Jim Sharp and the Billings BLM and our organization, my husband, my son, myself, and our wranglers tried very hard to accommodate all the public that wanted to photograph and watch this roundup. I personally escorted Elyse Gardner close to the pens so she could see close up some of the bands that had been brought in. Dave found two sites so they could watch and photograph the wild horses being herded into the trap Sites where everyone could see but still be safe and not be in the way or spook the wild horses. There was also a site that was really very close to the processing where anyone could observe the processing activities. The BLM conducted tours of the corrals. The public got to walk along inside the pens and take pictures or whatever. The public was invited to follow and photograph the horses being released. Troy and Dave made sure the public had a place to watch and photograph up on the mountain. I’ll just end by saying that when you are looking for something bad you can always find something bad. And if you are looking for something good you can always find something good.